Steve Katz is a New York-based singer, songwriter, and guitarist. He performs regularly at music venues throughout the city. While growing up in Brussels, Katz was a music junkie and spent countless hours listening to Pink Floyd, Santana, the Eagles and Supertramp—his mother’s favorite band, and an influence for which Katz remains eternally grateful to her. Music stores became his second home and Katz set out on an endless journey of discovering new artists from all genres—a journey that has guided and shaped his own development as a musician today. Katz has drawn inspiration for his diverse style of music through his extensive world travels. He has an ongoing love affair with India and plans to return there in the future. Beautiful and rich melodies along with his own distinctive style of guitar work compliment Katz’s soulful voice. 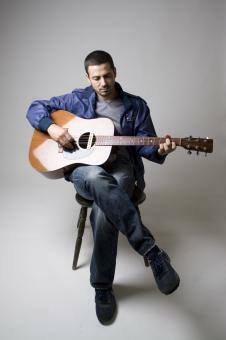 His style can be likened to Cat Stevens,Damien Rice, David Gray and James Blunt. Experimenting and creating new melodies are at the heart of Katz's passion for songwriting and hope, love and existential questions are common themes in his songs. Steve just released his first EP-Barricades . "I sense that Steve Katz is on the verge of commercial breakthrough with his music." "I always say that really good music--- the music that is far above the norm--- defies genre. These five songs are defiant as hell."